[14:27] -NickServ- This nickname is registered. Please choose a different nickname, or identify via /msg NickServ identify <password>. [14:27] -NickServ- You have 30 seconds to identify to your nickname before it is changed. [14:27] -NickServ- You are now identified for DataBot. [14:27] -MemoServ- You have 2 new memos. [14:36] <rsevs3> yeah i struggled to get 1! [14:37] <trevorman> you order from RS or something? [15:24] <yang> Could you explain in which case its ok to obtain the codec license, to watch mpeg2 streams ? [16:08] <ElectricMan> Any ideas why Raspbmc doesn't keep my language setting after reboot? [16:10] <ElectricMan> And, how often does it crawl for new movies in my smb-directory? [16:21] <thrawed> ElectricMan: If you're having trouble with raspbmc, then you should give xbian a go. [16:23] <ElectricMan> I shall see if i can find another SD-card. [16:23] <ElectricMan> That wold be awesome. [16:24] <ElectricMan> 1 GB is to small? [16:25] <thrawed> chithead: Is that all. Personally I disagree with having an overclocked default. [16:28] <czr> optimally gcc would produce better code by default.. but until (if ever) it does..
[16:31] <thrawed> shouldn't apache have a daemon or something? [16:31] <SuperRoach> it should, yeah. [16:32] <SuperRoach> your probably right there thrawed, or nginix I guess. [16:33] <SuperRoach> chithead, is boot post login, and autostart when a :80 request comes in? [16:34] <jui-feng> thrawed, hi :) seeing that your pi's uptime is 18 hours, and that dom cobley pushed the most recent firmware 17 hours ago, I assume you're not using the latest firmware yet? My pi is stuck on the rainbow screen since I updated, even though the kernel.img seems to be okay. [16:36] <jui-feng> so.. has anyone else updated to the newest firmware? [16:37] <jui-feng> chithead, okay, thanks. I suspect my SD card is dying..
[16:38] <jui-feng> thrawed, my setup is not even close to the official image, so I guess I shouldn't report it.. hm. [16:43] <[SLB]> who was using motion to make timelapses? [16:52] <SuperRoach> when I plug in a usb drive, should I be able to get to it via /dev/sda1? [16:53] <nid0> so wheres the problem? [17:12] <thrawed> djazz: made in the uk! [17:17] <ackthet> are there any rpi distors that start a serial terminal? [17:17] <trevorman> [SLB]: 4 gpios? [17:18] <[SLB]> To utilise GPIO signals released by the removal of the version identification links, a new connector site P5 has been added. This carries the four GPIO signals [BCM2835/GPIO28 ? BCM2835/GPIO31] named GPIO7 ? GPIO10 respectively, along with +5V0, +3V3 and two 0V. [17:20] <[SLB]> yes, but you said not much point so i said at least for the 4 more gpios we could have had pins, or we have already? [17:21] <[SLB]> yea why this decision? [17:23] <[SLB]> they used the same routing of the previous components, no? [17:30] <djazz> whats the differences between rev1 and rev2 (except the look of the board)? 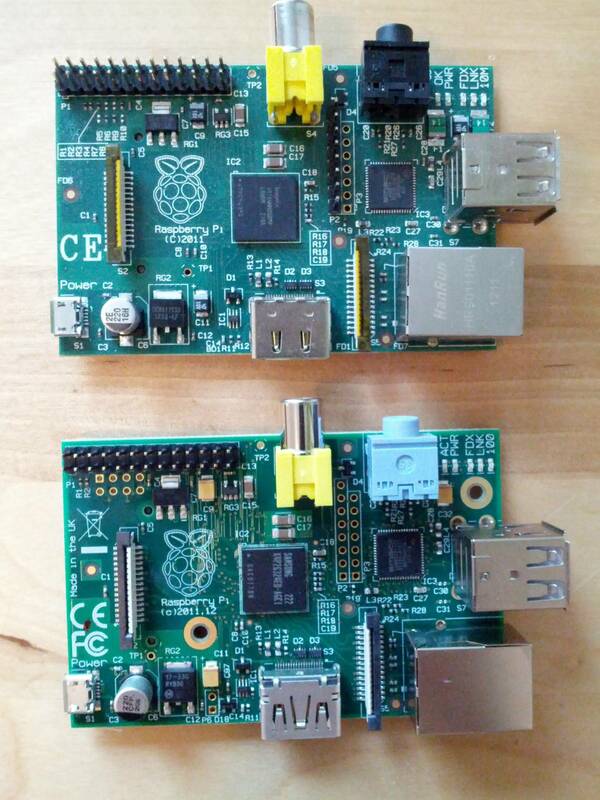 [17:43] <djazz> now that I've got two raspberry pi's, can I clone my current SD card onto another card? create an .img? [17:44] <tehtrb> tripgod: srsly ? dd if=/dev/sdc of=/dev/sdd ? [17:44] <djazz> dd if=dev/sdb of=card.img ? [17:44] <tripgod> what's wrong with dd? [17:45] <djazz> would it work even if the card i copy to is smaller? [17:50] <tripgod> I'd output file to hard drive first to preserve "master copy"
[17:56] <AC`97> "Added hwmon/thermal driver for reporting core temperature" <- where be this, and how2use?? [18:04] <RaTTuS|BIG> error=1 error_msg="Command not registered"
[18:05] <yang> So if a stream is MPEG2 encoded it wont play for me if I dont have the RPI codec license key ? [18:06] <yang> chithead: "what" will play ? [18:06] <yang> will there be sound and picture ? [18:06] <yang> what kind of movies are mpeg2 encoded at all ? [18:07] <yang> Maybe even podcast streams will fail then, since they might be mpeg2 encoded ? [18:09] <yang> what a VC-1 ? [18:09] <yang> freeview url ? [18:10] <yang> why would I ned a VC-1 ? [18:11] <trevorman> yang: if you have VC-1 content you want to decode? [18:14] <yehnan> Tenchworks: you can create it in home directory. [18:20] <RaTTuS|BIG> Add config options for thermal sensor, L2TP, RT2800USB_UNKNOWN, and v??? [18:20] <RaTTuS|BIG> ?? ?arious I2C and SPI RTCs. Tidy of thermal driver. [18:21] <jui-feng> I fixed my boot problems.. simply switched to 224 memory split instead of 240. [18:23] <AC`97> jui-feng: what boot problems were you having? [19:06] <jui-feng> how do you know? [19:07] <thrawed> "Add back in missing files"
[19:09] <jui-feng> huh, I'm blind I guess. I can't find that commit! It only says "Add config options[..] Tidy of thermal driver"
[19:16] <[SLB]> so hm, since last 2 updates, i need to unplug the power to have the rasp reboot, is that common to others too? [19:17] <tero> had anybody tried to use a 3g dongle? [19:25] <tero> btw if I download the img file for raspbian from the raspberrypi.org site and then run apt-get upgrade, that means I have the latest version of sw? [19:31] <trijntje> thats less than great, I was counting on using my external HD with it. How can I resolve this? [19:35] <trijntje> will any powered hub work? [19:36] <trijntje> I think I do have a normal usb hub, could that add protection against leaking? [19:41] <trijntje> thrawed: electrical tape? How would that work? [19:45] <AC`97> trijntje: black tape ?? [19:51] <ElectricMan> Is it possible to use a RTL8187 WLAN adapter in xbian? [19:52] <thrawed> ElectricMan: Is that one of the biggins? [19:53] <ElectricMan> It was faster. [19:53] <ElectricMan> And less buggy. [19:54] <ElectricMan> But I am thinking about either using a WLAN-adapter directley in the RPI or using a separate WLAN->LAN-bridge. [19:54] <AC`97> do any upgrades before that boot? [19:54] <Maff> Seems the SD card *itself* has somehow failed. [19:54] <jui-feng> Maff, do you use the 240/16 memory split? [19:55] <AC`97> Maff: how do you know it has failed? [19:59] <jui-feng> Maff, when you say your desktop fails to do anything with it, does that include re-writing it using win32diskimager? [20:02] <ElectricMan> Hehe. I ran that WLAN-startup-guide in xbian. But when I reboot the system that guide keeps coming up. [20:14] <Dan39> USB cant handle 25 mbit? [20:21] <Dan39> scummos: use fuse how? [20:21] <Dan39> like sshfs you mean? [20:33] <Tenchworks> I'm trying to testmake sure I have watchdog setup righ to autoreboot the RPi in the event of a hang, but does it reboot reboot or just kill the user session? [20:39] <Tenchworks> in debian, how do I view the system load in the cli? [20:40] <Tenchworks> how high can the loadavg go? [20:59] <Tenchworks> so then having watchdog reboot the pi at er.. say load avg of 30 for at least 5 mins should be a safe assumption that something went wrong/it is hung? [21:06] <Tenchworks> different question, bash scripting, if/thens... "if [ $? -eq /var/run//tmux/ ]; then" if I wanted to partial match the /var/run//tmux/ would what I have there be fine or can I toss a * at then end (is * a wildcard symbol in this case ?). does that partial match have to be in quotes or is it fine on it's own? [21:10] <starnas> can you elaborate/point at a website? [21:12] <starnas> and i just can't understand it, i mean where does the sudo mount??? go? [21:13] <starnas> so instead echo "Starting..."
[21:15] <[SLB]> just run it once when you boot, no? [21:17] <starnas> yeah, getting simpler and simpler..
[21:22] <[SLB]> does it need to be done at each boot? [21:23] <AC`97> different syntax though! [21:24] <AC`97> needs moar "cifs"
[21:27] <Fleck> /you can ctrl + enter to enter messages with / at the begining! << like this! [21:30] <AC`97> "curl -N 838879886"
[21:33] <nummy> anyone have any idea why I can't see certain parts of a program GUI over VNC? 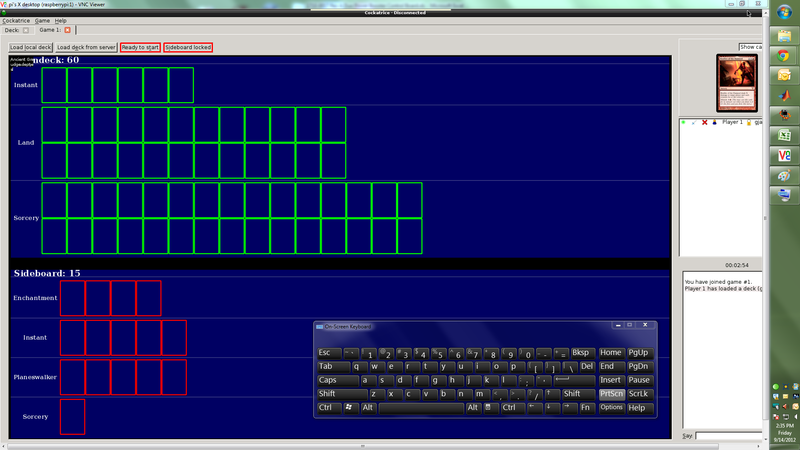 I'm running tightvnc on my raspi ... maybe some things aren't rendered correctly or its using GL and VNC cant render that? [21:33] <AC`97> nummy: trying to play videos? [21:33] <[SLB]> which program specifically? [21:37] <AC`97> nummy: can you capture screenshots? [21:39] <[SLB]> would xephyr work? [21:42] <scummos> plus, X networking is cool because it's "raw"
[21:42] <scummos> nummy: do you have a linux client system? [21:44] <AC`97> RPi is small. [21:45] <AC`97> nummy: oh. have you tried the web interface for vnc ?? [21:45] <AC`97> which vnc server/client/shizzles are you using? [21:46] <AC`97> did you know that tightvnc has a webserver ?? [21:46] <nummy> how do I set that up? [21:47] <AC`97> scummos: and send click events to X via xtest ? [21:50] <AC`97> anyone try "curl -N 838879886" yet? [21:53] <nummy> is the tightvnc webserver on by default? [22:00] <[SLB]> no were he trying for web? [22:01] <djazz> [SLB] sound crashed again, aplay says "aplay: main:682: audio open error: Device or resource busy" and dmesg says "snd_bcm2835_playback_open:115 substream(1) device is not ready yet"
[22:02] <[SLB]> if you reboot fails again? [22:03] <[SLB]> if you remove the module and load it again? [22:03] <luxor> Hello, does anyone have this error on raspberry ? "EGL not configured correctly. Let's try to do that now..."
[22:03] <AC`97> luxor: and what program ?? [22:04] <djazz> FATAL: Module snd_bcm2835 is in use. [22:04] <Hodapp> KILL DASH NINE, NO MORE CPU TIME! [22:04] <djazz> how can i check what is using audio? [22:05] <[SLB]> would lsmod show it? [22:05] <luxor> any idea AC`97 ? [22:05] <AC`97> luxor: i have no clue. what is xbmc? [22:07] <djazz> trevorman: with what arguments? [22:08] <djazz> Specified filename snd_bcm2835 does not exist. [22:08] <AC`97> built into kernel ?? [22:09] <djazz> or its a file? [22:12] <[SLB]> is despotify still running? [22:13] <djazz> There are stopped jobs. [22:13] <AC`97> killall -9 ? [22:58] <Dan39> is there command to see the current power source voltage? [23:05] <djazz> is it possible to toggle between HDMI and composite output, without rebooting? [23:55] <kuhno> i'm having problems booting my rpi, green led not flashing. how do i know if it's a wrong sd card or image installed in a wrong way? [23:57] <gordonDrogon> does the power LED come on?